Kabbalah.info, the world’s largest source of free spiritual content on the web, has just launched a new Kabbalah site for beginners in Hebrew at http://www.kab.co.il. 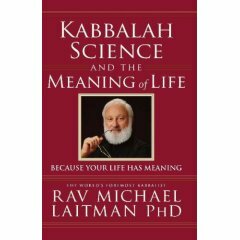 Kabbalah.info was founded by Michael Laitman, PhD, the disciple and personal assistant to Kabbalist Yehuda Ashlag’s son during the last 12 years of his life. The author of over thirty books, his most recent work – Kabbalah, Science and the Meaning of Life (Laitman Kabbalah Publishers/October 2006/$9.95) -- reveals the hidden aspects of reality to provide a complete picture of the world we live in, along with a deeper understanding of our personal and collective roles that are vital for humanity’s progress. Kabbalah.info is by far the largest, most extensive content site on Kabbalah, hosting 140,000 unique visitors, with over 1.5 million page views a month, as well as a newsletter in five languages with 28,000 subscribers. Available on http://www.kabbalah.info are authentic Kabbalah texts in twenty-two languages, including all books for free download. Live daily broadcasts of Kabbalah lessons over the Internet are simultaneously translated from Hebrew into English, Spanish, German, Russian, and Italian.